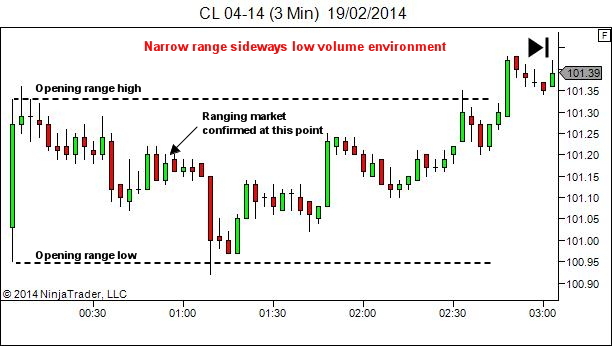 With hindsight, Tuesday's Crude Oil session started off the first few hours as a narrow-range sideways low volume market. Note to self – I've often said I should avoid rollover day. One day I should listen to myself. In a ranging market, the best opportunity is usually found at the edges, in particular when it traps those seeing a breakout of the range. But sometimes there is also opportunity within the range. In a wide ranging market there may be pullback opportunity within any intra-range trend. But there also may be opportunity available when the intra-range structure provides patterns showing a higher probability of a supply/demand imbalance. Wednesday's facebook post showed an example. 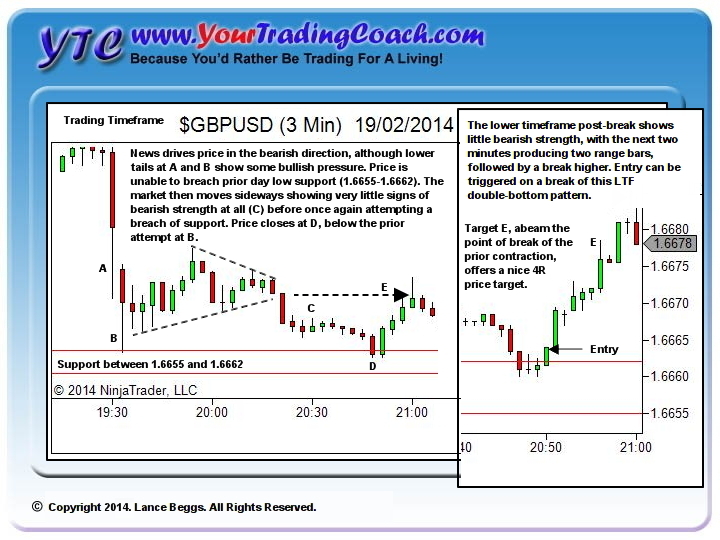 The image (copied here) displayed the trading timeframe and showed two locations where trade opportunity could be found. There was a comment in the facebook post asking where the entry is on the retest at C. In particular, they asked whether it would be as price broke the low of the long green bar into area C.
My response was that this would be far too late. 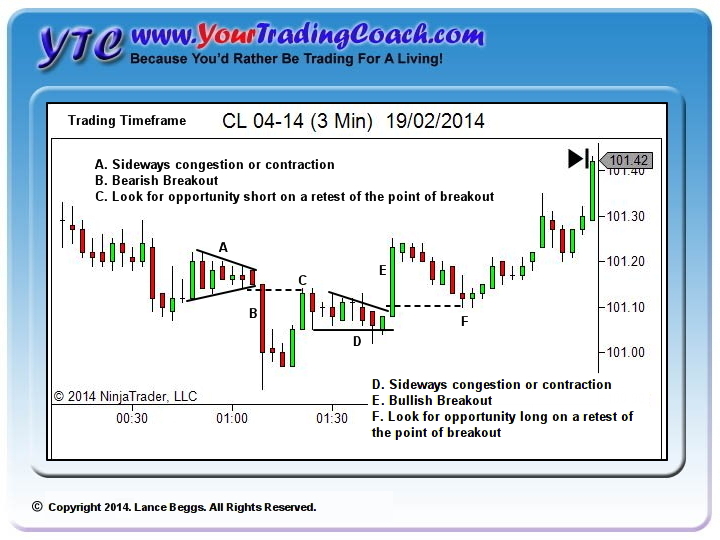 Entry must be taken on the lower timeframe closer to the point of breakout. 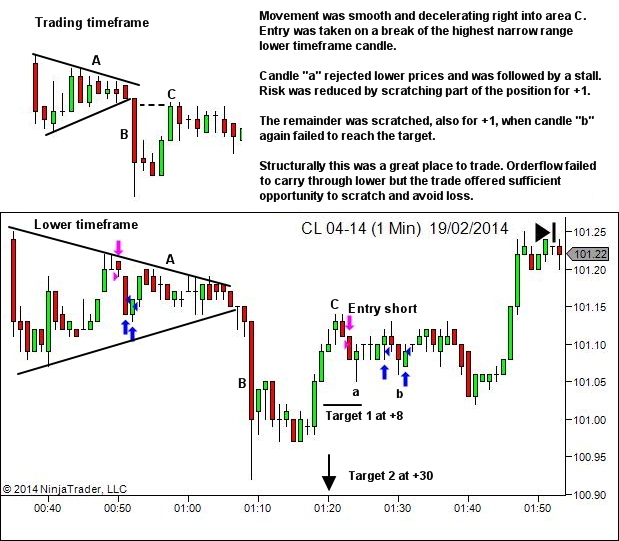 I added that I'd include lower timeframe charts in the newsletter… so here we are! Not all trades are winners! 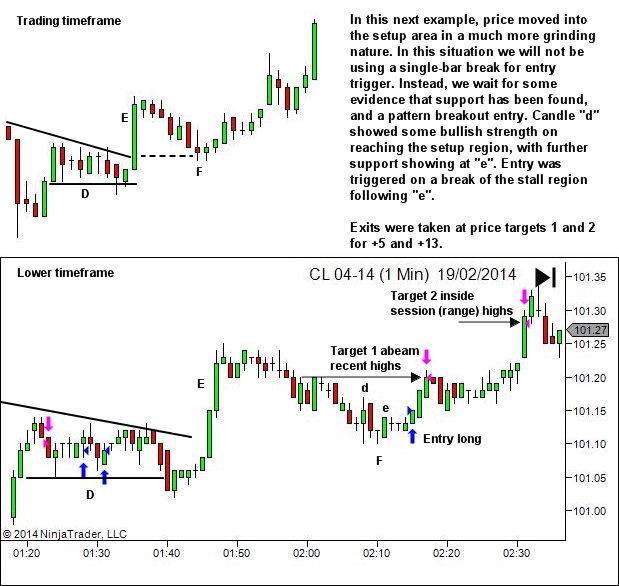 But as we discussed inlast week's article, our job is not to win on every trade. Our job is to win over the longer-term through identifying and managing good R:R opportunities. 1. Thursday's facebook post shows how these points of contraction can also be used as a price target, instead of an entry point. I want to commend you on your choice of trade illustration below. When I go through periods of poor trading it seems to be generally due to focusing on setups rather than context. I find that the better I feel I understand price action the more this problem arises as I become drawn to perfect looking LTF setups at odds with TTF context. Your choice of a relatively unimpressive setup in the example below emphasizes this point very well. Great setup + Bad context = bad trade. Mediocre setup + appropriate context = good trade. Thanks for the continued effort! This is so very true. Today's article shows a great example of this concept. Each of these setups is a rather uninspiring example of a pullback trade. But that's the nature of trading. What makes them a good trade, in my opinion, is that they were at the right place on the chart. The more I involve myself with education, the more I'm convinced that the "setup" approach to teaching is perhaps wrong. More important is "where to trade". Trade in the right area of the chart, and enter with the right risk, and you've got a good opportunity to profit. More on this in future YTC articles!